Indians believed to have been wearing Saree for around five thousand years. Styles of wearing the Sari have regional differences and there are around 80 different ways Indian woman wear their Saree. 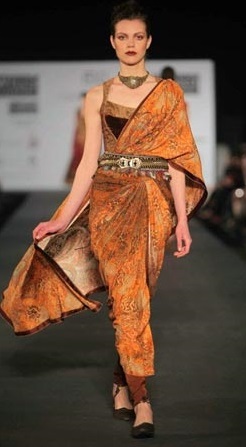 New trends and designs have surfaced in Saree design in the last decade. Saree draping styles, shades of colours and accompanying blouse designs have changed considerably over the years, though these changes are not reflected in the styles of common folks. But wedding ceremonies and fashion shows display the new generation’s attribution to colour and pomp. Introducing the designers who brought in the wave of change are out of scope for this article. But displaying a few of their designs, we hope will suffice for the occasion.